ï»¿ Artistic bio: "View on 1789 Revolution"
Artistic bio - "View on 1789 Revolution"
After a long period of introspection, around the year 1985, Marie-Lydie Joffre feels like exploring new domains. She starts a four year period of bibliographic and iconographic research concerning the key figures of the French Revolution of 1789. This documentation work -done while continually painting- stems from her desire to nourish herself from the life and historic context of the French Revolution characters so that she can better recreate their portrait: "I was reading the whole biography, I needed to understand the personality of my models and feel admiration for them in order to bring life to their portrait." Marie-Lydie Joffre's project named "View on 1789" receives the sponsorship of the BNP Bank in the context of the commemorations for the French Revolution 200th anniversary. Two travelling exhibitions are scheduled in more than 30 French towns. 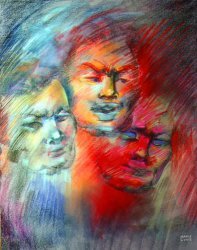 Ces visages d'ange si finement pastellÃ©s par Marie-Lydie, sont aussi bien ceux des grands tÃ©nors rÃ©volutionnaires de l'An 1, fauves sanguinaires, que ceux de leurs victimes qui perdirent leur tÃªte pour que triomphe la libertÃ©. "View on 1789" exhibition in several Cultural Centers such as Montpellier's house in Heidelberg, Germany, among others.